Augmented Steps This "haptic" floor can mimic the look and feel of sand. 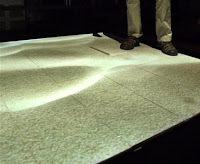 The modular "haptic" floor tiling system is made up of a deformable plate suspended on a platform. Between the plate and platform are sensors that detect forces from the user's foot. And the plate can give off vibrations that mimic the feeling of stepping on different materials. A top-down projection and speakers add visual and audio feedback.